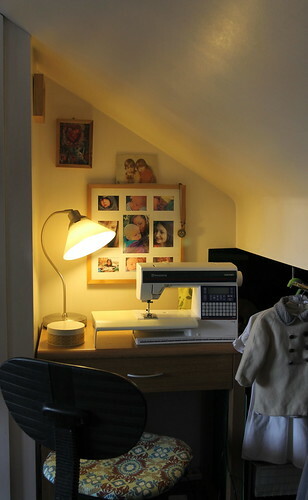 I dream of the perfect sewing space. 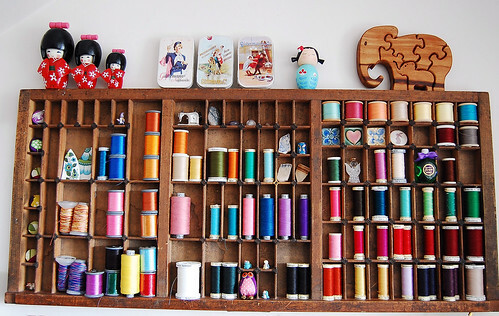 Sometimes when I can't sleep I plan in my mind my perfect sewing room, light and airy with a dedicated cutting table, desks for different machines,shelves filled with stacks of beautiful fabrics and haberdashery....I have a whole pinterest board full of studio envy. The reality though, for most of us is far from my dream sewing space. Certainly it is here. Most people are not lucky enough to have a whole room at their disposal, if you do, that's wonderful, and I'm very jealous! You can still sew in even a very small space with a bit of imaginative organisation. As I mentioned in a previous post , I have moved my sewing space as my family has grown. I live in a fairly average (UK) sized semi detached house. Of course in my case, five lively children in a four bedroomed house doesn't exactly leave much room for anything else. Teenagers tend to drape themselves and their general detritus everywhere I look, while toddlers leave a trail of destruction. There are always shoes, and coats strewn about the floor, no matter how many times I pick them up. 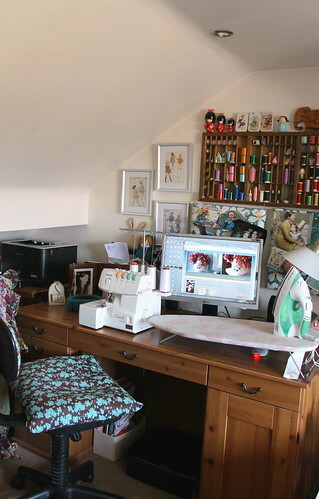 I usually set up the desk top board and my overlocker on the larger desk I share with Woody. Under the eaves of our loft bedroom there is lots of storage space, and that is where I store all my fabrics and tools less often used. I cut out on our dining room table, though I do have a lightweight cutting board I picked up in a local charity shop that I can use on the floor or on the bed if I need to. I would only do this for small craft projects, not for dressmaking. I'd be afraid I'd be compromising my accuracy, and I'd end up with a sore back too. My tiny space is far from ideal, but it's workable, and for me, more importantly is away from the hub bub of life in our busy home. I have tried to sew downstairs, but it was too stressful an environment, with food and drinks left too close to precious fabrics, not to mention paints and grubby toddlers. Sewing for me is a kind of therapy, it's time to create and relax, something I found impossible while dinner was being cooked around me, and children were walking past me in their muddy boots, or dripping their ice lollies. You don't need a huge sewing space, but if you have one, lucky you, there is lots of inspiration out there on the web, especially on Pinterest to help you create that perfect space. 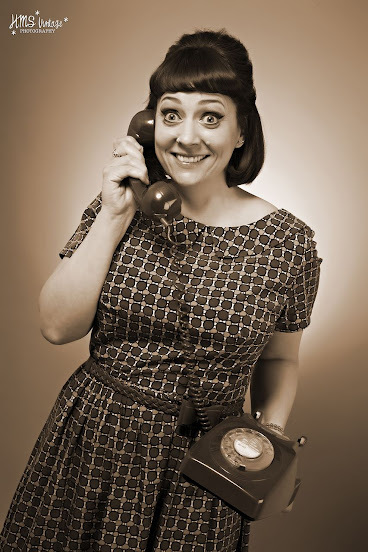 Look around your home, can you squeeze in a desk somewhere, an alcove in the dining room or your bedroom? Or even a cupboard? I've seen photos of sewing spaces fitted in to old pantries and even large wardrobes, that way everything shuts away when not in use. I have used furniture designed for housing home office equipment very successfully in the past. Ideally choose somewhere with good light, but also consider artificial light for duller days or evenings. A good angle poise lamp, possibly fitted with a daylight bulb is essential. Make sure your chair is comfortable and a good height to work at. You'll be spending lots of time at your machine, you need to be comfortable. Can you fit shelving or pegboard above your machine to store essential tools, and threads? I use an old printers tray to store my threads, above the larger desk I share with Woody. If you can, having your iron and ironing board set up in the same room is best, but if there is no space then a table top ironing board is an adequate compromise, especially for smaller craft items, and children's clothing. A full length mirror is essential if you are making clothes for yourself. I'm sure most people reading own one. It doesn't have to be in the same room, but it is helpful if it is. I have a full length mirror in my en suite bathroom. Finally, I know I've said here that I prefer to be away from the hub bub of family life when I work. I realise that for some people that is not an option. In which case, consider setting up your sewing space in a corner of your children's play room, if you are lucky enough to have one. Otherwise look for a space nearby, so you can work and interact with your children at the same time. For several years I sewed while Sid played quietly at my feet, Ernest though is whole other kettle of fish, he doesn't do anything quietly ever! As I mentioned, Pinterest is fabulous for inspiration , as is Flickr . I borrowed this book from a friend a few years ago and found it very helpful. 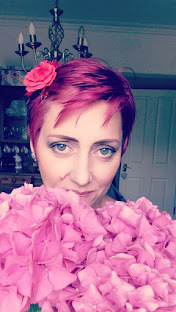 I'd love to hear about your sewing spaces, or plans for a sewing space, and links to photos would be even better. 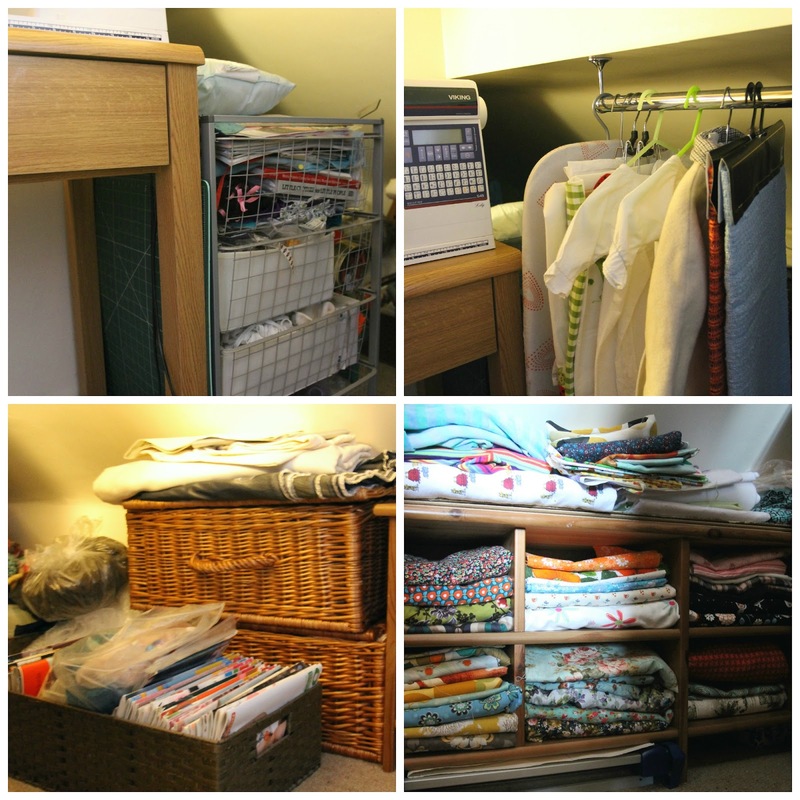 What are your top tips for a successful sewing space? I'm not sure I will ever have my own space, but it is nice to dream!